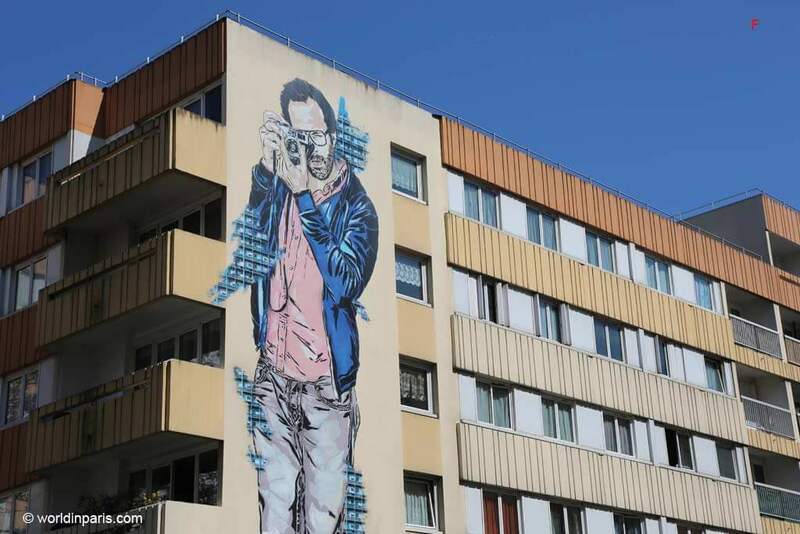 Did you know that Paris is home to some of the most exciting street art in Europe – even the world? 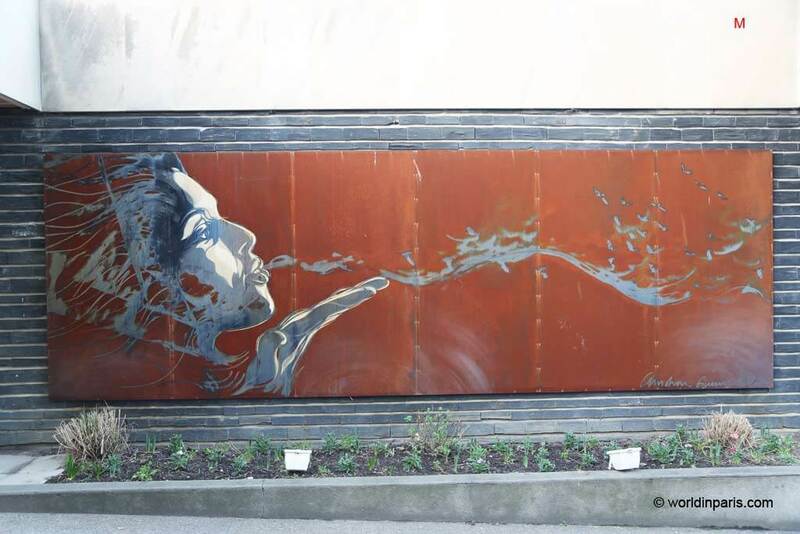 One of our favorite Street Art Paris district (by quantity and quality) is Paris 13. Traditionally a “grey neighborhood”, Paris 13 is today in continuous transformation. 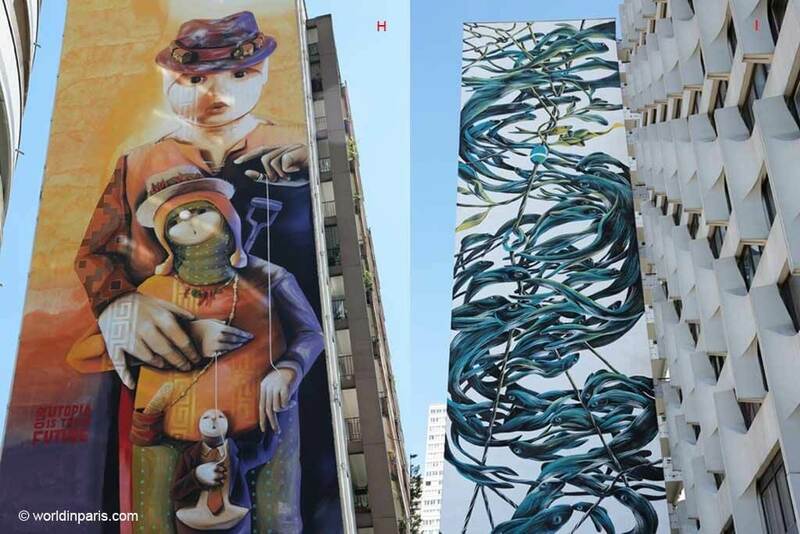 Its once characteristic ugly towers or streets without any charm are now highlighted thanks to street artists from around the world. 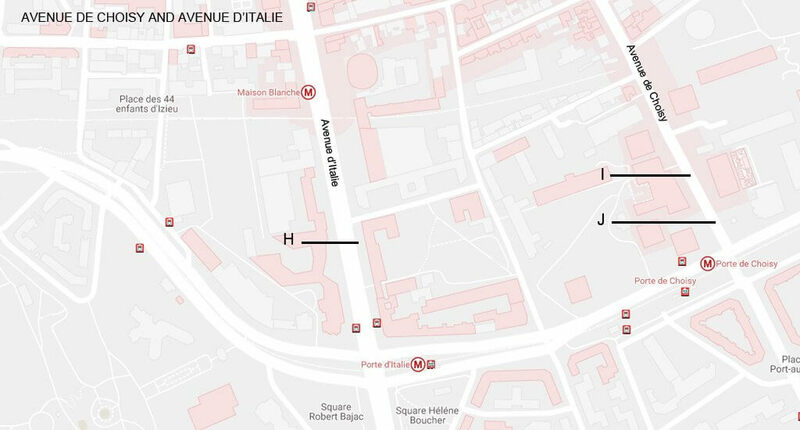 The great culprit of Paris 13 District’s transformation is its mayor, Jérome Coumet, and his team. 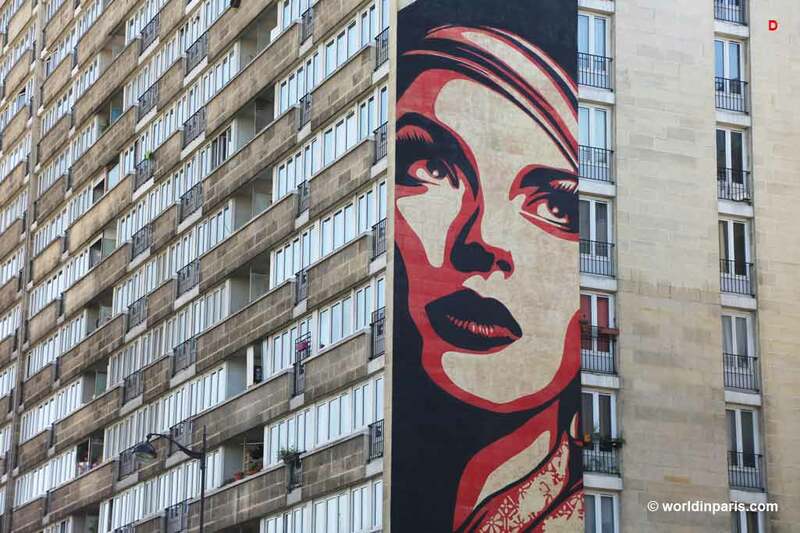 The socialist at the head of Mairie Paris 13 since 2007 is especially interested in street art. 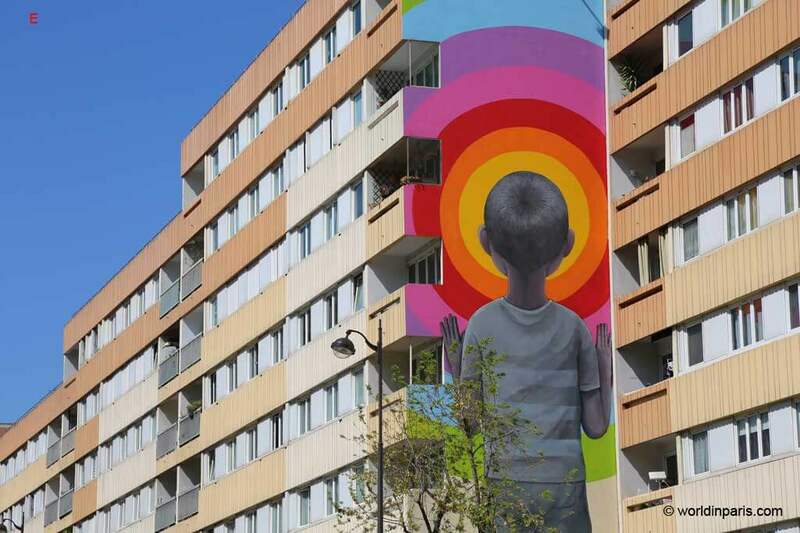 With this spirit and enthusiasm, Paris 13 is using Street Art to heal its image and attract young people proposing them a cool neighborhood to live. Warning! Unfortunately, Street Art is an ephemeral art. 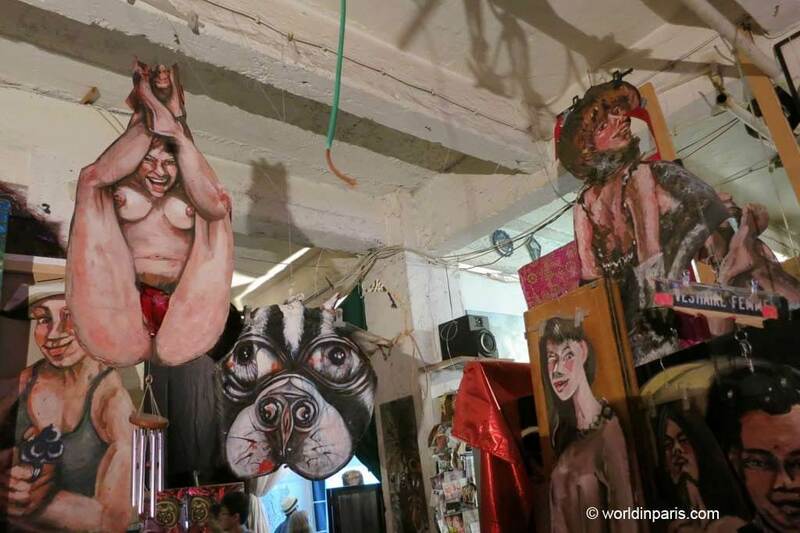 World in Paris spent 4 days between February 17 and May 17 tracking the artworks shown below. We consider this post up to date but some of the works proposed may be damaged or destroyed after some time. This calm and picturesque quarter combines pretty cobblestone lanes with interesting graffiti Street Art. A Street Art stroll around Butte aux Cailles is a very nice way to discover this quarter while following talented artists. Butte aux Cailles is also an excellent place also for a drink or a nice dinner, especially when the weather is good and you can sit outdoors. This is a very special place. This huge hangar with many refrigerated rooms was built after the WWI to stock all the products transported by train from the countryside to Paris before going to the different Parisian markets. Abandoned since the sixties, in 1980 the SNCF (the French National railway company) rented out parts of the warehouse to artisans and artists. Today Les Frigos hosts 87 workshops in a very special atmosphere. The frigos’ external walls (but also inside) are covered with interesting graffiti street art. This is a new wave of art affecting people. Definitely not traditional art in the galleries but outside, where everybody can enjoy it. Paris 13 managed to attire famous street artists doing high-quality giant murals which cover some huge buildings without character. When street artists have the permission and don’t need to hide from the police they can do something really beautiful. They can take their time and make it great. And actually, that’s what happened in Paris 13 with the Mairie’s support. This quarter has a very charming countryside atmosphere. The street artworks here are small, a scale which fits very well to its narrow and winding lanes. The most famous street artists in Butte Aux Cailles are Miss Tic and Jef Aerosol, both French artists. Miss Tic Street Art has literally invaded the quarter with her B&W graffiti, always expressing her ideas through poems and wordplay. What we like from Miss Tic is the sense of humor in her wordplay but if you don’t speak French maybe you will appreciate her work less. Jef Aerosol also works in B&W. He has created many portraits of famous people like Elvis or Gandhi but the main part of his work is dedicated to the anonymous people on the streets: musicians, beggars, children playing… It is very easy to recognize Jef Aerosol’s work because he always signs with red arrows. 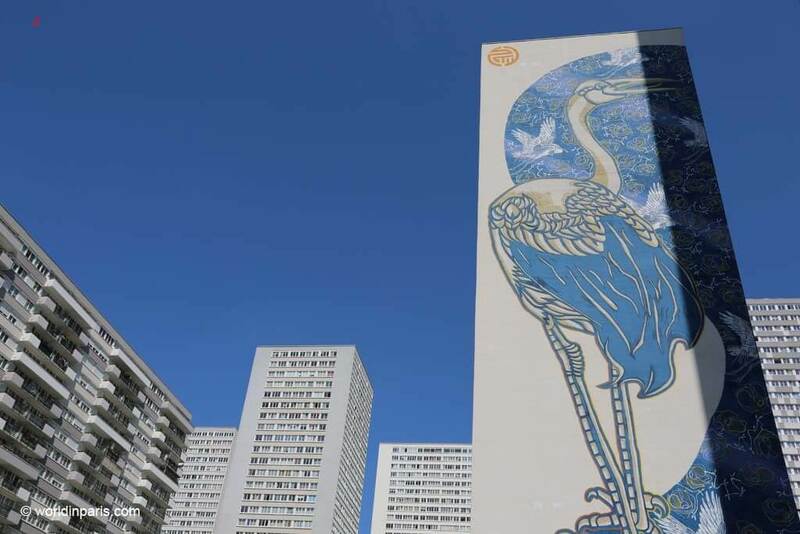 Huge murals by famous street artists from all the world have invaded the biggest avenues in Paris 13 and now street art is part of the landscape. Some people define Boulevard Vincent Auriol like the Champs Elysées of Street Art. Along this wide avenue crossed by the metro and its surroundings, it’s where you can find most of these giant murals. The cool thing about Boulevard Vincent Auriol is that the metro (L6) rides by so you can see these murals from different points of view. 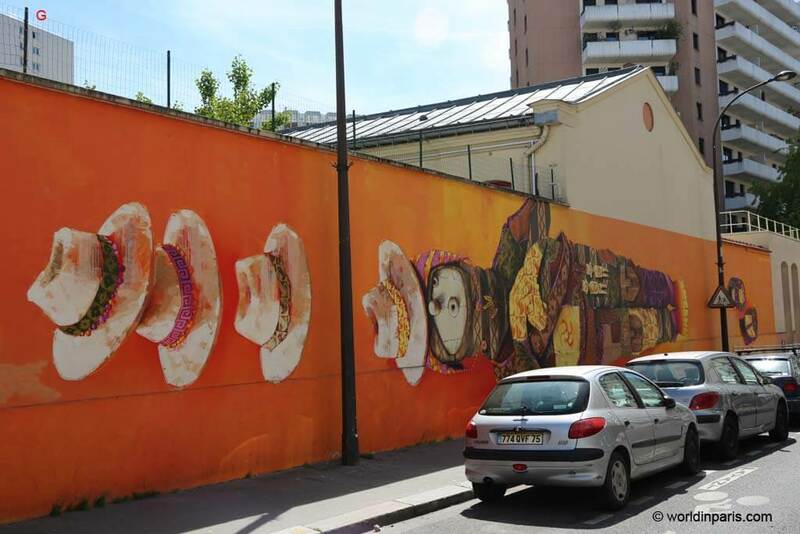 Other interesting murals are located between Avenue de Choisy and Avenue d’Italie. 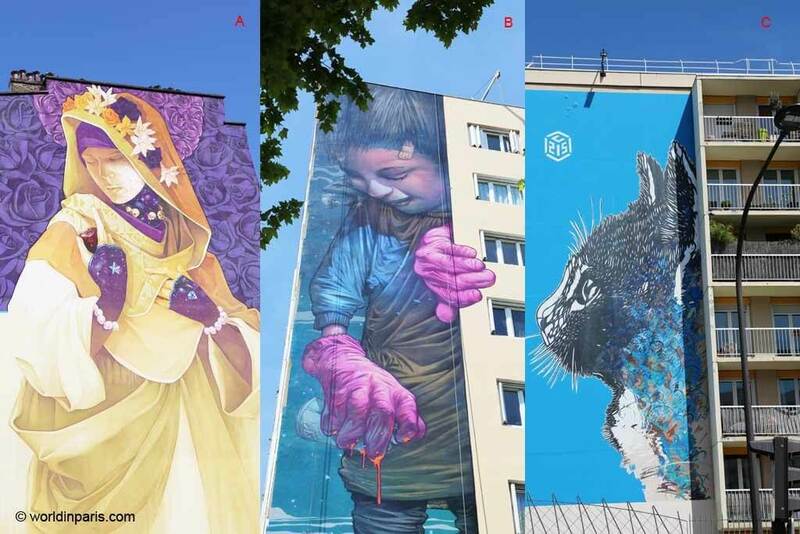 The main authors of these giant murals are Sainer and M-City (Poland), Vhils (Portugal), Kislow (Ukrania) OBEY (US), Inti, Maher, and Aner, (Chile), Ethos (Brazil), ZED (Tunisia + Morocco) and Jana & JS (France-Germany). France is represented by Seth Street Art, Babs, Rero, SteW, and C215. 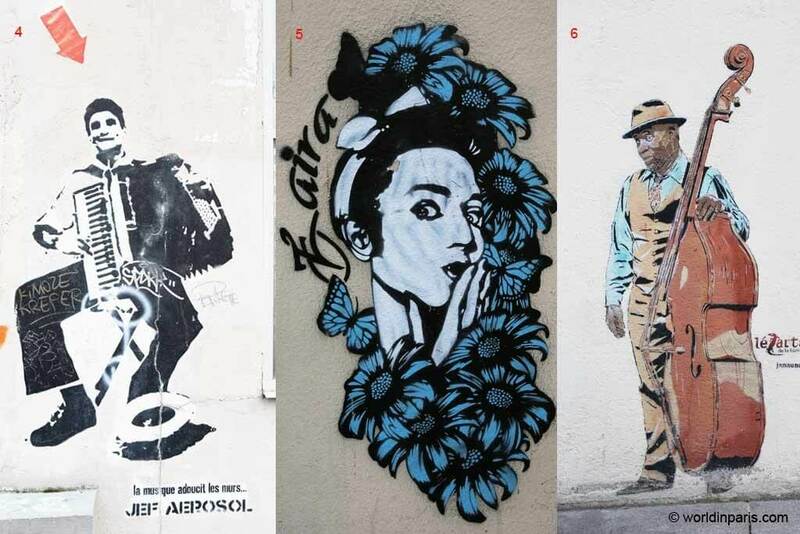 C215 is one of our favorite French street artists, by the way. C215 ‘s work consists mainly of close up portraits of people usually forgotten by our society: beggars, homeless people, refugees, street kids . .. He also likes to feature cats and his daughter Nina, who become also a street artist. He has a very defined style and you can also recognize his work by his signature, a dice with C215 inside. This is just a selection of what you can see in this area. If you follow this walking tour you will find along your way other murals and graffiti, this area is full of nice surprises! 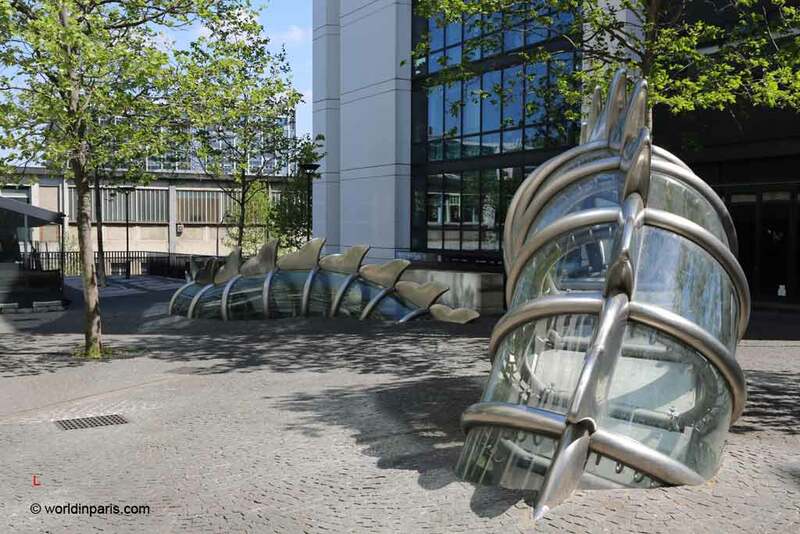 The following artworks are located outside the above-mentioned areas but some of them are so beautiful that we could not finish this post without them. If you have some extra time, these cool graffiti and urban art are worth a detour. Did you like the Street Art in Paris 13? Which street artwork /street artist you liked most? Wow! This street art is awe-inspiring and stunning. I am surprised how my missed this art while I was there! 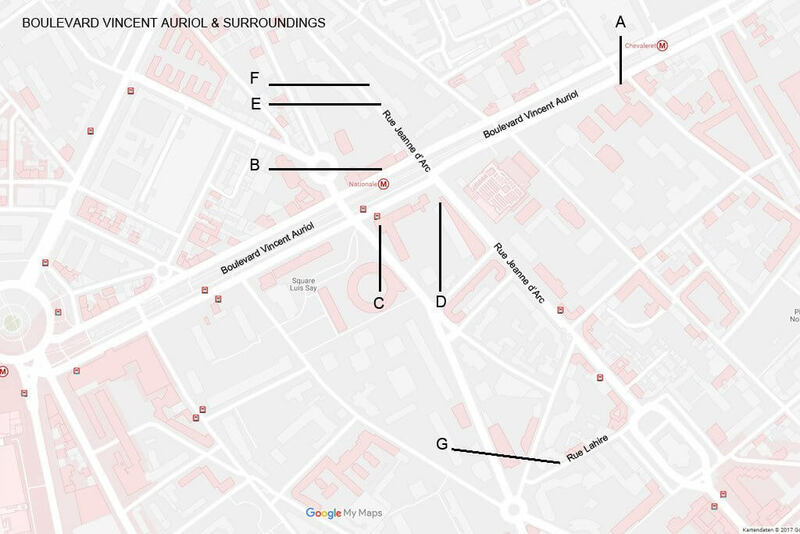 I appreciate how you’ve labeled the art with letters and included a map to show where they are – very helpful. 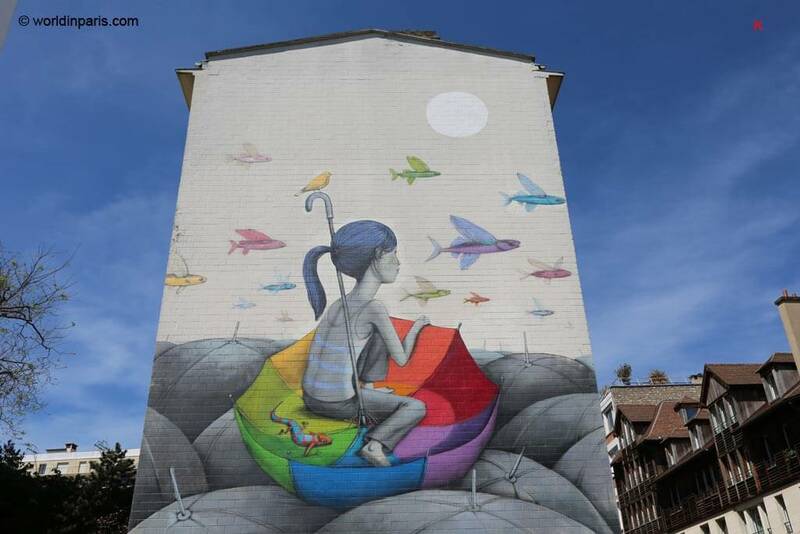 I’m a huge fan of street art and finding these murals would be a fun way to explore the city. I particuaraly like the crane mural! I am sure that you would enjoy a lot this Parisian tour, Lara! I absolutely love street art! Paris has such amazing work. This guide is so handy! Some of these are so beautiful. Taking one (or more) of these walking tours would be a refreshing change to the usual things to see in Paris. I love the first image and the one of the child in the umbrella. I’m a big fan of street art and Paris is one of my top destinations in my bucket list! Will surely do a diy street art tour when I get there. I hope to see as much as I can. A really great post, particularly with the inclusion of the map. Street art is such a topical travel subject at the moment. Great to see Paris has joined the movement too. When I travel I spend more time looking for street art than in galleries and museums. This is a fantastic resource that I am sure I will use on my next trip to Paris. Thanks so much for creating it. 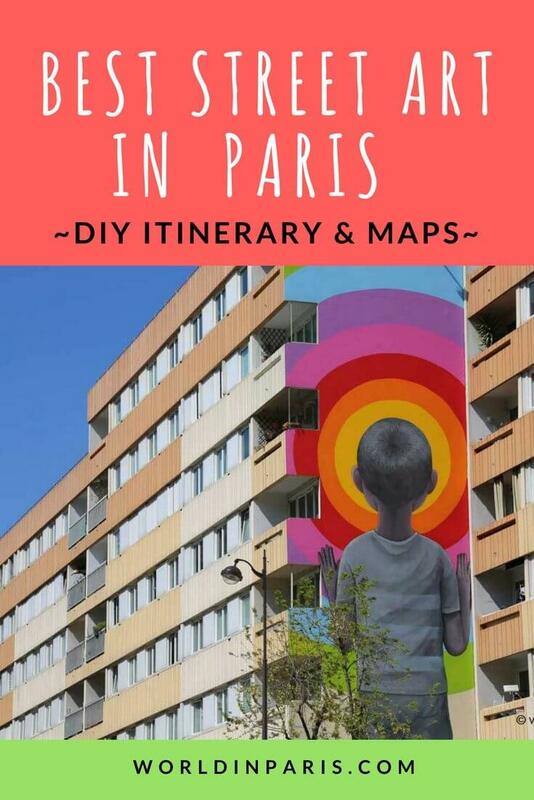 Great street art guide – I don’t think I’ve seen one for Paris before. I also am a huge fan of street art. Nice to read the mayor encouraged it. The first one on this page surprised me, as I haven’t seen one quite like that in public. My favourites are the two painted ones in your other section. Loving this street art and thanks for pointing out where each piece is, this is so helpful! We always try to explore a cities street art and these are so cool! These look amazing, pretty neat, and have intricate details. I was expecting to see messy street arts and murals but these look really good. I like the choice of colors too. I like the giant blue bird a lot. I love finding street art when I’m traveling. There are some great pieces here. The great thing about street art is that you never know how long it’s going to last. I love the impermanence of it! I love that you included the book options for Paris lovers. It’s so refreshing to see a culture that doesn’t immediately condemn street art as some sort of gang symbol (Americans do it ALL THE TIME). I adore Paris and this is yet another reason. Thanks so much for sharing. Can’t wait for our next trip to the French capital. So Street Art is not popular in US and Street Artists are condemned? 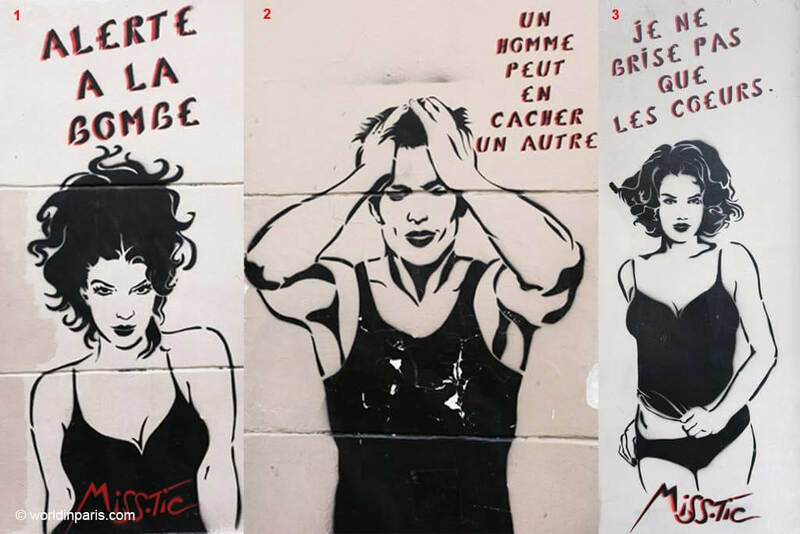 So strange, Street Art is very trendy in France . . 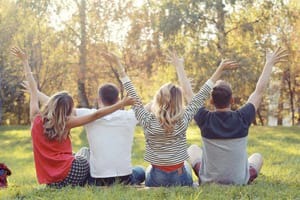 I used to live in Paris so I found this article really fascinating. I didn’t know that the Mayor was so into street art, that’s great. Love that you did a map as when I was recently in Tulum trying to find the street art it was a real challenge. 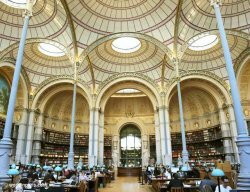 This will be a great resource for visitors to Paris. I adore street art but have never done a street art tour of Paris. This needs to change! Gosh I’d never even considered Paris as a destination for great street art, it’s not the mental image I have at all and yet you have shown me there are some fantastic examples to seek out!